One thousand five hundred and sixty five runners finished this Race – starting and finishing in pretty horrible weather conditions by any standard. In 2017 Ben Fish came second in this Race to Mohammed Abu-Rezeq but managed to turn the tables this year in finishing ahead of him to win the Race in a time of 69.09. Ben spoke to the Club about the Race and his win telling us that the “First three miles in hailstone and I knew that a fast time would be impossible in those conditions. Road was slushy and slippery too. Abu-Rezeq had a small gap of 50 metres up to about 8-9 miles then it was neck and neck. I think he was having a tough time in those conditions, as usually he pulls away and holds the gap. We reached 10 miles in a slow 53:20. Got a small lead around the 11th mile. Mo needed assistance at the end, but thankfully he seemed ok afterwards”. Three hundred and fifty two finishers in this Race run like the Four Villages Half-Marathon in pretty grim weather conditions to say the least. 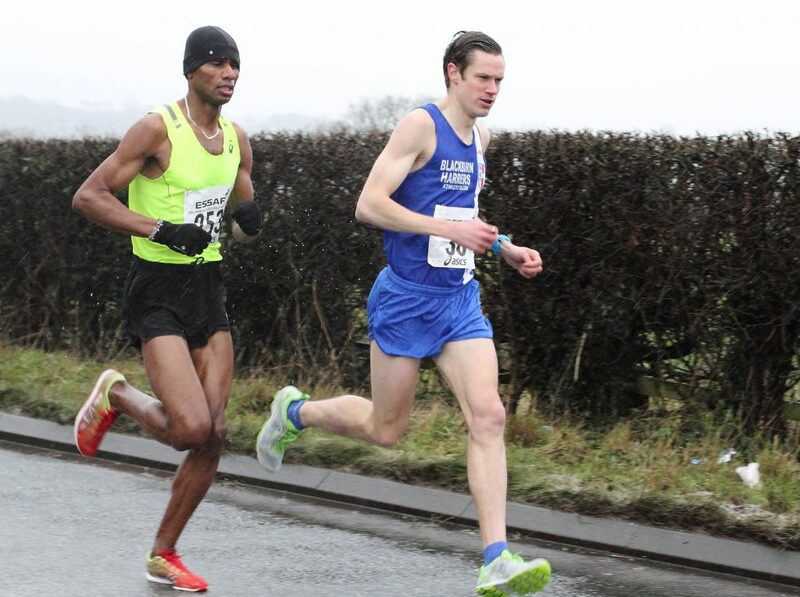 Four Blackburn Harriers competed – Chris Davies – Paul Brindle – Joanne Nelson – Carol Reilly in the Race which was won by Stuart Robinson in a time of 70.59. 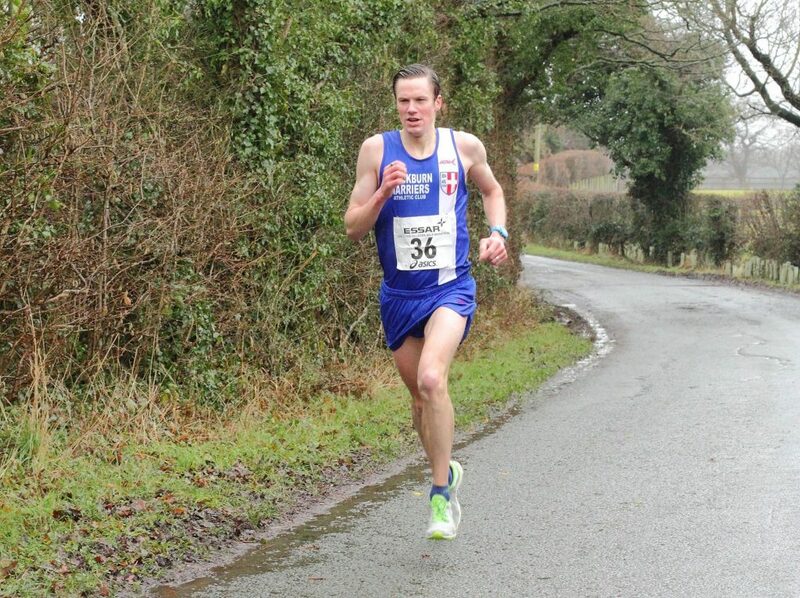 Chris Davies was the first Harrier home in a new personal best time of 75.32 and told the Club after the Race “Today was just about seeing were my form was at in preparation and for my training for the London Marathon. When arriving I wasn’t feeling to optimistic due to the weather being really poor. It was really cold with some wind which made some parts of the course difficult. I’ve been running for a while now and I have to say that’s the coldest race I’ve taken part in. That said I am pleased with how things went. After 3 miles I found good rhythm in my running and felt good up to the 10 mile mark. Unfortunately my right calf began to tighten which made for uncomfortable last 5K. I managed to dig it out though and managed to knock a second of my PB. It’s not much but a PB is still a PB and it’s a good way to start the New Year in my races. I know I can run quicker and in better conditions I know I can get under 1:15. A terrible day for racing but a good outcome which made it all worth while in the end”. Paul Brindle had a tremendous run chopping four minutes off his previous best time of 83.55 to record a new PB of 79.56 in 21st place. Joanne Nelson was the first V45 Woman home and 3rd Woman overall in the race as she placed 68th in a time of 88.26. Carol Reilly finished in 159th spot clocking 1hr 41.45. 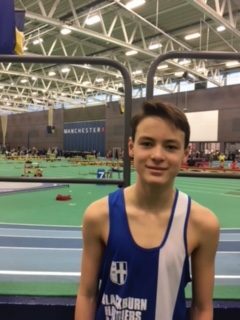 Ben Boocock’s been doing the Sale Harriers indoor athletics series at Sportscity in Manchester continuing to improve as the series has gone on. On Sunday he was pleased that he managed to knock 0.28 of a second off his previous best time and set a new PB for the 60m Hurdles of 9.98 (3rd) and the first time he has managed to dip inside ten seconds. Although Ben was pleased with his run he still believes he can improve on that time and it’s his first year as an U15 and he wanted to thank Paul and Bob for all their coaching and support. 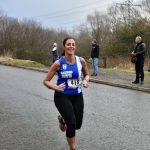 Two Blackburn Harriers – Lorna Sharp and Lindsay Davies are running this years London Marathon in aid of their two favoured Charities. Lindsay is running her challenge for Mind. ‘We’re Mind, the mental health charity. We won’t give up until everyone experiencing a mental health problem gets support and respect’. Get Kids Going! 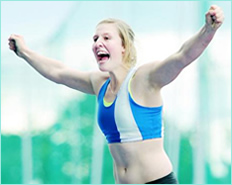 is a national charity which gives disabled children and young people – up to the age of 26 yrs – the wonderful opportunity of participating in sport. We provide them with specially built sports’ wheelchairs so they can do: athletics, marathons, tennis, skiing, rugby, sailing, boccia, basketball, sledge hockey, table tennis, fencing, shooting, archery, powerlifting and many more sports. Get Kids Going! inspires British disabled youngsters to compete in sporting events, from start to paralympic level, by also giving them sports grants to help with their; training, physiotherapy, travel, competition fees, design and development of sports’ equipment etc. With your help many can become world record holders and paralympic champions!